Welcome to the next level in master-planned communities. Bahia Principe has everything you need to live, work and relax in style and comfort. Providing luxurious residential options, resort-style amenities, designer golf courses, easy access to shops and restaurants, and convenient business units, Bahia Principe is every luxury-lovers paradise. Spanning over 300 tropical hectares, Bahia Principe offers living options to suit full and part-time residents with a various needs. Choose from luxury villas, turnkey condos, or multiple lot sections to create your own custom-made home. Five-star hotels, specialty restaurants, an array of bars, luxury pools and spas, tennis courts, and a beach club, add another layer of both panache and functionality. For golf lovers, Bahia Principe features two Robert Trent Jones II designer golf courses. One is a championship 18-hole, par-72 golf course, and the other is as an executive 9-hole, par-27 course. As if all of this wasn’t impressive enough, Bahia Principe is also a perfect example of ‘mutually beneficial integration.’ Each branch of the community automatically provides a service to the other branches. For example, the tour guide company assists the hotels, the hotels assists the resorts, and the resorts provide the amenities for the residents. A remarkable, and ideal setup. 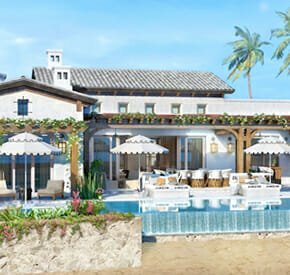 Having completed its initial phase of development, Bahia Principe is working on its next step – Terrazas. Terrazas will allow homeowners hassle-free rental returns in order to attract investors, second-home owners, and full-time residents alike. So, what is Terrazas? 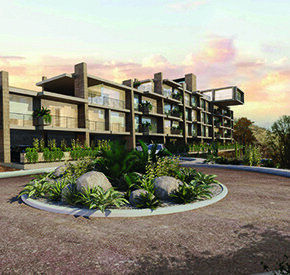 It’s a new, contemporary-style condo complex neatly situated adjacent to Bahia’s Riviera Maya Golf Course. It includes four buildings with a total of 60 one, two, and three-bedroom units from 68 to 252 square meters (738 to 2,720 square feet). The buildings feature an innovative design based on overlapping rectangles giving way to large open spaces, big terrace areas, and cutting-edge floor plans. Residents of Terrazas will not only have access to all the amenities in Bahia Principe, they’ll also have their own family friendly amenities. These will include two lagoon-styles pools with recreational areas, a playground for children, an outdoor social area for grilling, two multi-purpose rooms, and a gym. 24/7 security and concierge service for both promised. What Else Mexico Such a Sound Investment? It’s located in a full-service beachfront resort in one of the most visited countries in the world. The surrounding region has been designated as a zone for tourismdevelopment by the Mexican government and tourism authority. It’s located minutes from four nature-based theme parks – the Mayan ruins at Tulum, and the ancient Mayan city of Chichen Itza, a UNESCO World Heritage Site. If you want to earn rental income, but would rather not deal with the practicalities yourself, you can simply put your unit in the rental management program. This service will take care of everything – marketing, booking, and administration. The rental management fee is 30% of your gross rental income. With a 45% occupancy rate, you could achieve a 5.62% net rental yield with a one-bedroom studio and a 7.40% net rental yield with a two-bedroom garden-loft unit. Or, you could manage these responsibilities yourself to maximize your rental income. With websites like Airbnb and VRBO, finding short-term renters has never been easier. Plus, using such services will reduce your rental management fee to 10% of your gross rental revenue. The group behind this development has over 30 years of experience in real estate development, international hotel management, and tourism. We all know that experience is key when it comes to building a successful community. Terrazas at Bahia Principe is ideal for anyone who’s looking for a vacation home that the family can enjoy, and one that stands to generate easy rental income for decades.